Typical British gourmet products. That’s the first thing that came to my mind when I heard about Living in London. 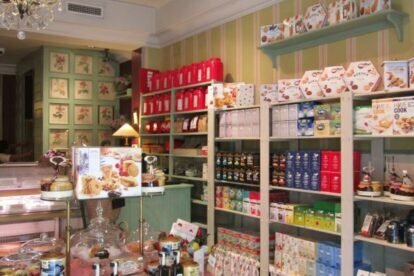 But it is much more, on one hand there is a tearoom with a delicatessen shop at the entrance, and next door there is a British goods store, specialized in gifts and decoration objects. So, forget about all the British stereotypes, say goodbye to the Union Jack and embrace the sweet and delicate decoration of both places. The tearoom looks like a Victorian doll house, and all the details are carefully taken care of. Jams, many kinds of English teas, cookies, sweets…, everything looks delicious and is not extremely expensive for being import products. Perfect for breakfast or for an afternoon snack, the pastries and cakes are made on site, baked and presented with jam and clotted cream, following the true English style. My recommendations: muffins and, of course, scones, the classic English teatime treat. Besides they are very difficult to find in Madrid. If you go with a group of two to eight people there are two types of tastings menus in three sizes (small, medium, big): Chelsea (tea pastries, mini sandwiches, scones and croissants) and Ascot (a selection of mini sandwiches and slices of homemade cakes). But this place is more than it looks, because after a trip to Tanzania, the owner of Living in London, decided to designate a percentage of the profits to finance various charity projects in Mang’ola Chini Valley.